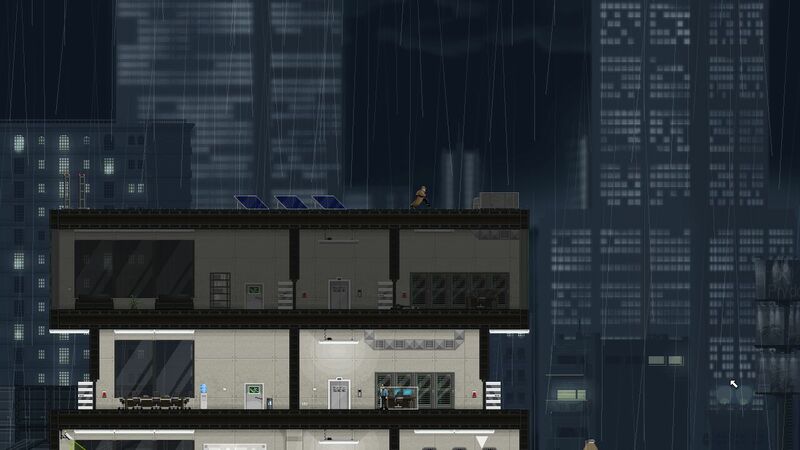 Rewiring security in this 2D stealth-puzzler is a blast, but it’s too short to fully embrace more advanced levels. There’s an old joke that all critics really want to be creators – game critics want to be designers, film critics want to be screen writers, music critics want to be rock stars, etc. Occasionally a critic does successfully make that leap. Even late film critic Roger Ebert wrote an odd X-rated pseudo-sequel to Valley of the Dolls in the 60s. 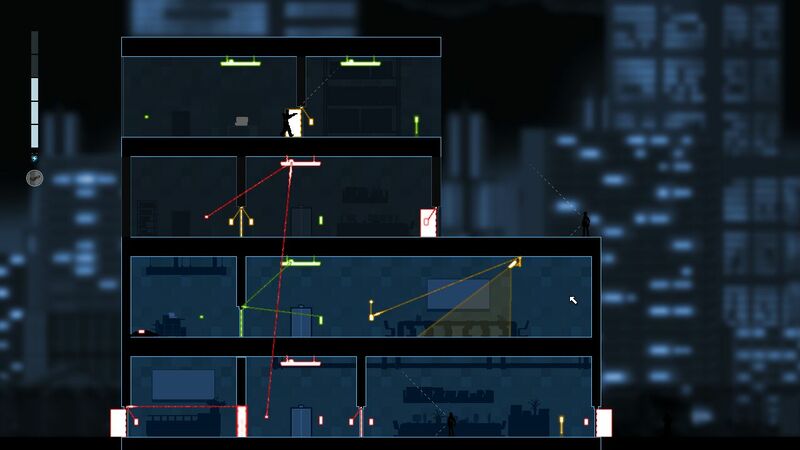 Former PC Gamer editor Tom Francis may not be a Roger Ebert, but his one-man stealth-puzzle game Gunpoint is a triumph of simplistic but effective 2D puzzle design. Gunpoint stars Richard Conway, a private investigator that lives in a pixelated world full of guards, security cameras, and breakable windows. During the opening sequence Conway witnesses the murder of a potential new client while trying out his new Bullfrog brand Hypertrousers. The pants allow you to charge up super jumps, breaking through windows and falling from any height. This allows you to concentrate on the puzzles in each level rather than any tedious platforming. Conway is suspect #1 in the murder investigation, and the story follows a funny tale as he’s hired to first erase the data by one party, then try and recover it by another. The story unfolds through a simple text-based dialogue between a pair of pixelated faces. It’s a rudimentary as you can get. Thankfully the writing is particularly amazing. I laughed out loud throughout the unfolding noir drama that maintains its self-aware snarkiness. Too bad none of the fun story moments really affect the missions in any way. Each level is made up of one or two buildings. You can see everything inside, from cameras to guards and doors, and can plan accordingly. During the excellent tutorial missions Conway gains the Crosslink. The Crosslink allows you to rewire various security and electronic devices. You can make a lightswitch open a door, or a camera trigger an elevator. The Crosslink is required to get through any mission. Soon you’re introduced to the Wirejack and multiple colored circuits, requiring you to reach different panels to control different groups of devices. It adds a linearity to the puzzles but also clear goals: I need to use the red devices to get to the blue panel, then use the blue devices to access the data. Armed guards roam the buildings and Conway is swiftly gunned down by a single gunshot. Guards can be pounced on from behind or above and knocked out, or avoided. Later more advanced guards like Enforcers and Professionals are added, though my stealthy tactics rarely changed. The levels telegraph what you need to do a bit too well. I was never stuck or confused, but it also felt a little easy. Just when things are starting to get a bit more complex and the levels a bit bigger, it’s over. 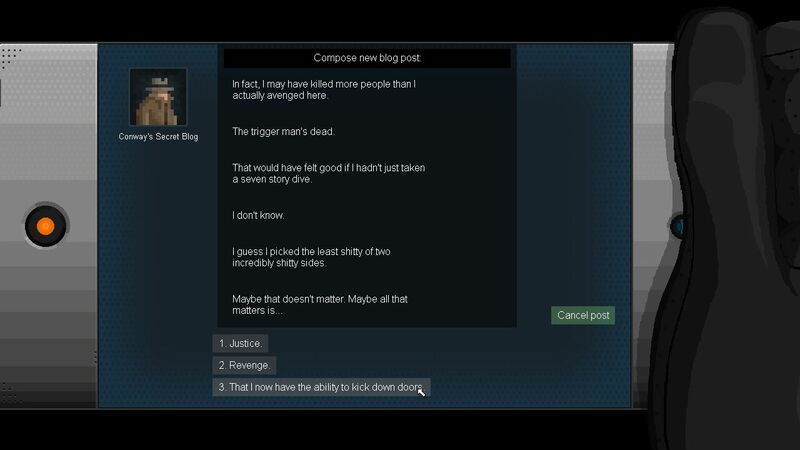 I usually praise indie games that are short and sweet. In Gunpoint‘s case, however, it’s exceedingly short at around 4 hours. That puts it around Portal length, but I feel like there was still a lot more game I could play – more advanced puzzle designs, bigger buildings, more objectives. Gunpoint does offer full Steamworks mod support so fans can pick up the pieces for additional play. Even though the story wrapped up in a decently satisfying way (aside from the annoyingly action-packed final mission) I left the game wanting much more. The writing and gameplay are solid, but special mention needs to be made of the excellent jazzy soundtrack. The music takes on a distinctly synth sound when you flip over to Crosslink mode to view the colored wiring of a building. The effect is just fantastic and helps bring the otherwise uninspired pixel art to life. Gunpoint seems to end almost as quickly as it starts, but what’s there is a lot of fun. The mixture of 2D puzzles and stealth works well, and ratings at the end of each mission add a dash of replayability to each level. On one hand it’s the sign of a good game that I want more of it, but in this case the game really could’ve used some more advanced side missions and bigger end game levels to really challenge our snarky, super-jumping spy. Final Say: Rewiring security in this 2D stealth-puzzler is a blast, but it’s too short to fully embrace more advanced levels.